Tulip: "Are you recording this, hoomin? Next time, double the mint, remember dill and raspberries for everybunny." "Nanners, grab some nanners" added Rose. "Should we write it down for you?" implored Petal. Fleetie, thank goodness you are not in that sink hole we read about! Although, I can understand how this trio could inspire one with the desire to hide. You read about a sink-hole in Manchester, UK? If so, I am surprised. But yes, there was one on a road in Manchester recently. No, I'm not in it! I wouldn't be able to feed these bunnies their saaaaalad, if I were there! And that would not be good. I want to be as impersonal and correct as possible about this, soooo, glad you are still able to make it snappeh for the bunns. Oh, and, yes this is Texas. We read about sink holes in Manchester. What else would we be doing. Well, truth is, our bunns like stories about big holes. I guess enough is just never enough ... they surely LOOK well fed. It's amazing how these three buns can hoover up their saaaaaalad, between them! Sink hole--do you mean work? He has spoken of it in such terms, I believe. 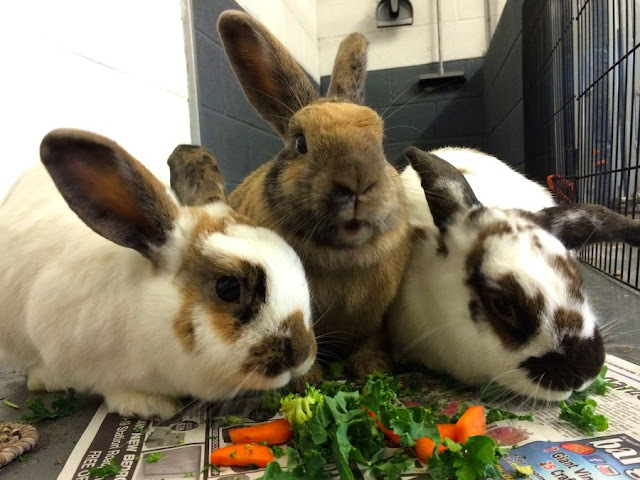 These three adorable buns are full of personality! Rose, on the right, is the Mama bunny, and Petal and Tulip are her daughters. Rose is a very powerful Disapprover! I know. Trust me! In fact, I think one of her Disapprovals (of me) was on here a while ago. In this photo, her booplesnoot is at full strrrrreeetch, chasing some saaaaalad! Petal is the most affectionate! She LOVES forehead-to-forehead rubs! And I love giving them to her! It feels so lovely, my forehead pressed against hers, and I know she really loves it, because she'll stay touching foreheads as long as I do it! Oh, Fleetie, that is so beautiful. Thank you for all you do for the Bunnehs.